(Nanowerk News) Plant components that bend, roll or twist in response to external stimuli such as temperature or moisture are fairly commonplace in nature and often play a role in the dispersal of seeds. Pine cones, for instance, close their scales when wet and open them again once they have dried out. André Studart, a professor of complex materials at ETH Zurich’s Department of Materials, and his group have now applied the knowledge of how these movements come about to produce synthetically a composite material with comparable properties ("Self-shaping composites with programmable bioinspired microstructures"). 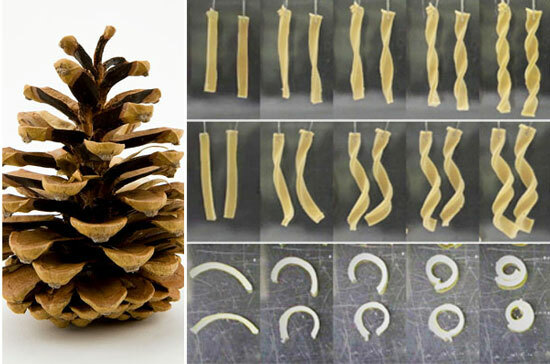 Studart and co-workers knew from the literature how pine cone scales work: two firmly connected layers lying on top of each other inside a scale are responsible for the movement. Although the two layers consist of the same swellable material, they expand in different ways under the influence of water because of the rigid fibres enclosed in the layers. In each of the layers, these are specifically aligned, thus determining the direction of expansion. Therefore, when wet only one of the two layers expands in the longitudinal direction of the scale and bends on the other side. Inspired by nature, the scientists began to produce a similar moving material in the lab by adding ultrafine aluminium oxide platelets as the rigid component to gelatine – the swellable base material – and pouring it into square moulds. The surface of the aluminium oxide platelets is pre-coated with iron oxide nanoparticles to make them magnetic. This enabled the researchers to align the platelets in the desired direction using a very weak rotating magnetic field. On the cooled and hardened first layer, they poured a second one with the same composition, differing only in the direction of the rigid elements. The scientists cut this double-layered material into strips. Depending on the direction in which these strips were cut compared to the direction of the rigid elements in the gelatine pieces, the strips bent or twisted differently under the influence of moisture: some coiled lengthwise like a pig’s tail, others turned loosely or very tightly on their own axis to form a helix reminiscent of spiral pastries. “Meanwhile, we can programme the way in which a strip should take shape fairly accurately,” explains Studart. The researchers also produced longer strips that behave differently in different sections – curl in the first section, for instance, then bend in one direction and the other in the final section. Or they created strips that expanded differently length and breadthwise in different sections in water. And they also made strips from another polymer that responded to both temperature and moisture – with rotations in different directions. After all, it is the rotating movements that interest Studart the most and that evidently were difficult to achieve until now. “Bending movements,” he says, “are relatively straightforward.” Metallic bilayer compounds that bend upon temperature changes are widely used in thermostats, for instance. The new method, however, is largely material-independent, which means that any material that responds to external stimuli – and, according to Studart, there are quite a few – can potentially be rendered self-shaping. “Even the solid component is freely selectable and can be made magnetically responsive through the iron-oxide coating,” he says. Accordingly, in response to the question as to possible applications, Studart highlights two completely different directions which his group is looking to research further in future: one is the production of ceramic parts that, instead of being pressed into shape as they have been until now, bring themselves into shape. And the ETH-Zurich professor sees another possible use in medicine: using the new method, implants could be produced that only become effective in their definitive location in the body and would fit precisely. “Ideally, these would also be biodegradable,” adds the researcher.s collective electron response is caused by the electric Coulomb forces between the different ions and minimizes the total electrostatic energy in the crystal. Such behavior is highly favorable for charge collection and injection in optoelectronic devices.